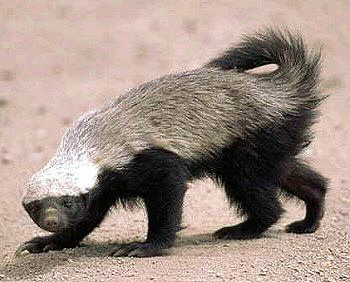 Honey badgers are small creatures found in a variety of biomes, from tropical forests to deserts. Compared to common badgers, honey badgers are nearly identical in terms of behavior; they are just as prone to rage, randomly attacking other creatures in their vicinity for no reason, including passing dwarves. They are solitary, unlike the common badger who appears in large clusters, but honey badgers possess the distinction of being food thieves. As such, make sure to keep them out of your stockpiles. They possess noticeable sexual dimorphism, with their males being significantly larger than females, though they're still smaller than normal badgers. A newborn honey badger is called a cub. Honey badgers can be captured in cage traps and trained into cheap exotic pets. Being food thieves, a food stockpile surrounded by traps can be used as bait to capture them. They give equivalent returns to a normal badger when butchered, but appear much less often in comparison. An enraged honey badger can serve as a distraction against intruders, but don't expect it to survive a fight against anything bigger than itself. Some dwarves like honey badgers for their fearlessness and their tenacity. They have a reputation among players for attacking random dwarves at the most inopportune moments, such as knocking fisherdwarves into rivers or dwarves working at high elevations off mountains, usually leading to their death from drowning or typical falling complications. Here are a few interesting facts about Honey Badgers from a renowned expert. This page was last modified on 25 November 2017, at 17:17.